Founded and funded by EveryVoiceinAction Foundation, the school offers project-based curriculum to its new class of freshman and sophomores. We toured the facility and met two of the teachers who were full of enthusiasm and hope for the school. At the dinner buffet, we met one of the incoming freshman, a shy, sweet girl who recently graduated from Booth Fickett Middle School. She chose the school because of its small class size (no more than 25) and accessibility to her neighborhood. I asked her if the fact that each student will receive an IPad also factored into her decision, and she said, "no, but I will like that very much." 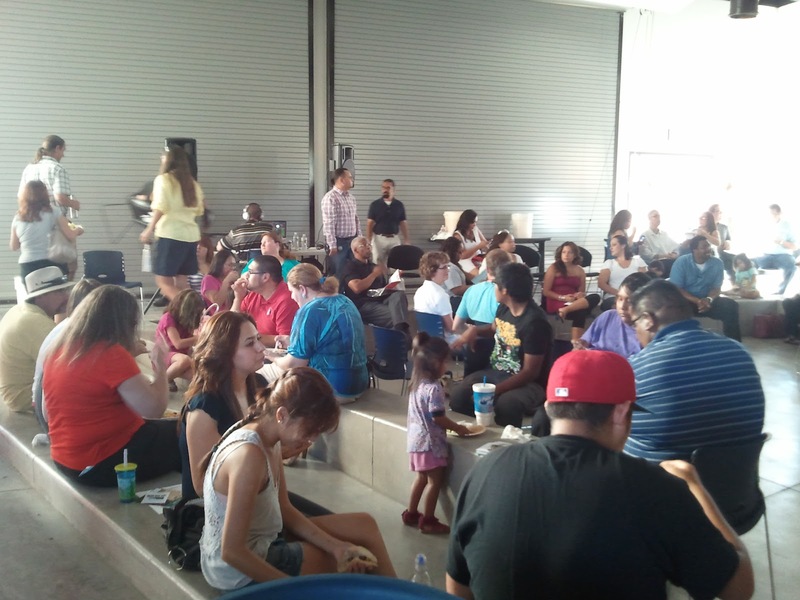 Hubby-photoguy took this photo of the community gathered together to hear welcoming remarks from Pima County Supervisor, Richard Elias, among others. Both of us left with promises to ourselves to followup with one of the teachers we met to offer our talents as school volunteers.